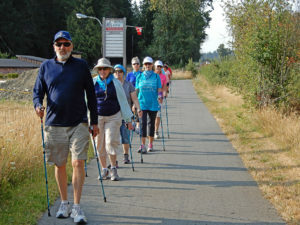 Try NORDIC STYLE pole walking to see if you like it! LEARN the essential SKILL that transforms this exercise into the best exercise on the planet, so that you effectively exercise 90% of your muscles! EXPERIENCE the harmony of all your muscles working together in a relaxed way. ENJOY the feeling of better posture and more oxygen in your lungs. TAKE the pressure off your joints so that muscles can relax and pain can subside. RELAX your neck and shoulders! NOTE: Arrive a few minutes in advance of the 1:30pm start time, so that we can get through the administration quickly. Hopefully you have registered and paid online, but if not, please bring $20 cash for registration. 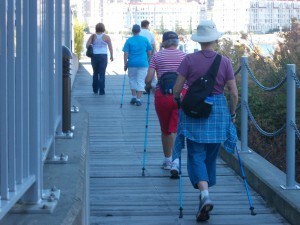 You will borrow poles for free for the class. 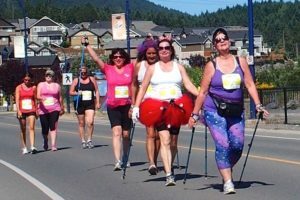 If you like Nordic pole walking, you can buy the NORDIXX poles with the GLOVE STRAP at the end of the class for $91 (includes taxes, cash, cheque, Visa, MC). 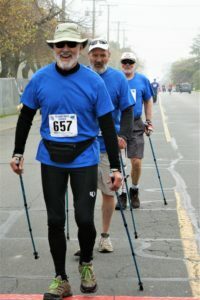 Do not buy poles before this class, as you will learn the all about poles so that you can make an educated choice between trekking, rehab, and nordic styles of poles, and you will want Nordic poles with glove straps. 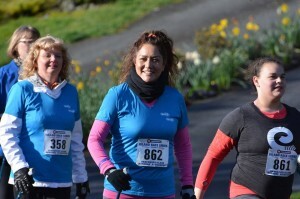 TO REGISTER FOR THIS CLASS CLICK ON THE BUTTON ABOVE AND FOLLOW PROMPTS. IT WILL DIRECT YOU TO PAY BY PAYPAL, VISA, OR MC. 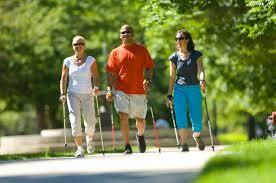 Try Nordic pole walking to see if you like it! Why Nordic pole walking creates benefits so quickly! 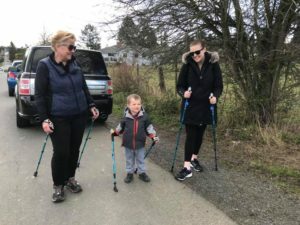 For most of the time we will be walking along a smooth, quiet, well lit sidewalk learning how to add the two skills required in pole walking, to basic walking. We learn a bit, then practice, learn the next bit and practice it. By the end of this session you will understand the basic movements of Nordic style pole walking, and have a good feel in your body if you like it or not. 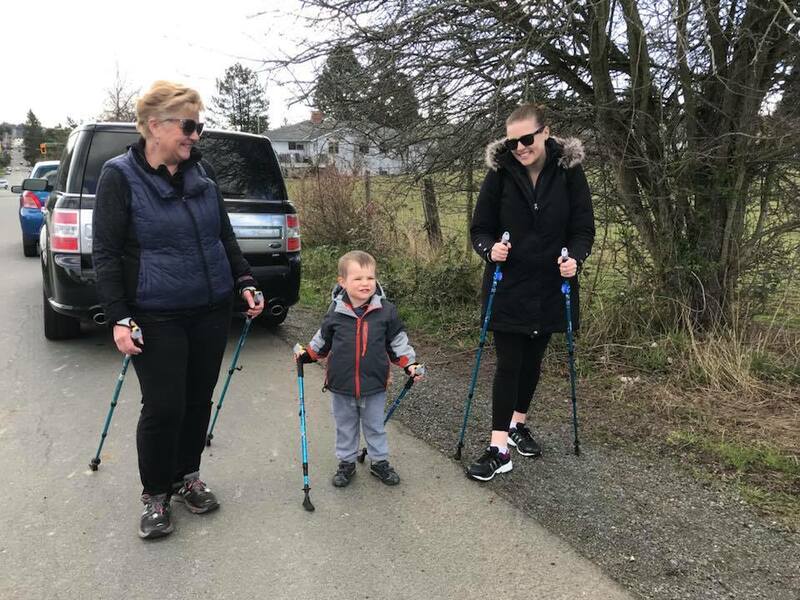 I’ve given you the whole picture to illustrate that pole walking, once learned, is a skill you will have for the rest of your life. The better you get at the technique part, the more results you will create with the same amount of exercise time. This whole experience starts with one LEARN LESSON. 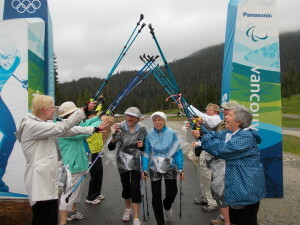 To date more than 2500 people have learned to Nordic pole walk with me. To register and pay with PayPal Visa MC on this secure site, click the button. 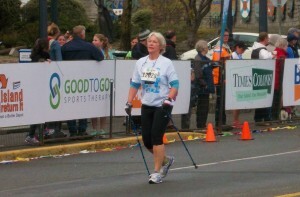 Try Nordic pole walking. See if you like it! $20, borrow poles for free during lesson. NB: You must pre-register for the lesson you want. 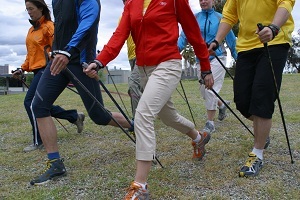 The basic skill of Nordic style pole walking. You may not be a master of the skill at the end, but you will have enough of an experience to know if you would like to continue or not. If you took a Learn lesson in the past, THIS IS ALSO A GREAT WAY TO REFRESH YOUR SKILLS. Every time I teach a class I learn a more effective way to teach. 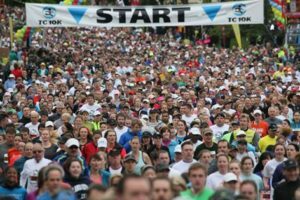 What I know now in terms of getting people started quickly, is quite different. 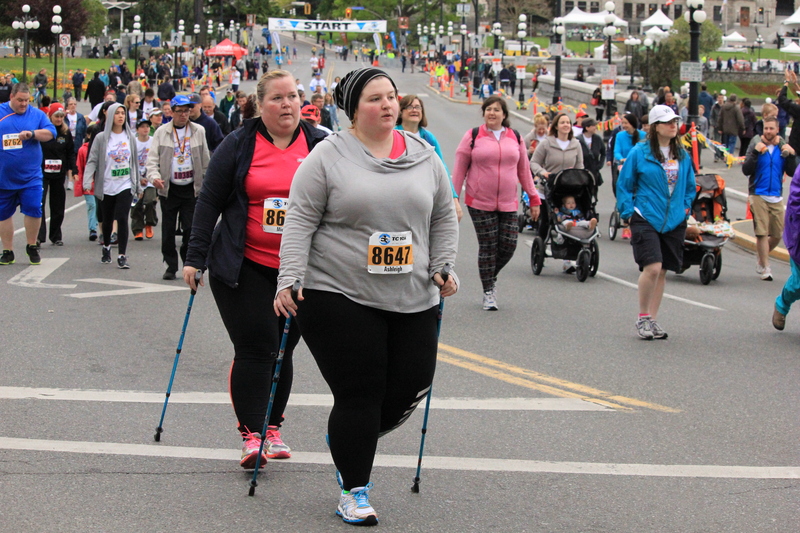 The difference between different kinds of poles, the advantages of Nordic poles for Nordic pole walking, and how to adjust the height of your poles to suit you perfectly. 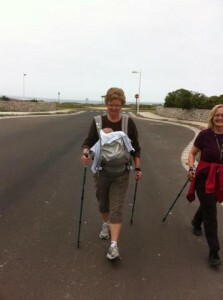 What health benefits Nordic style pole walking gives you. 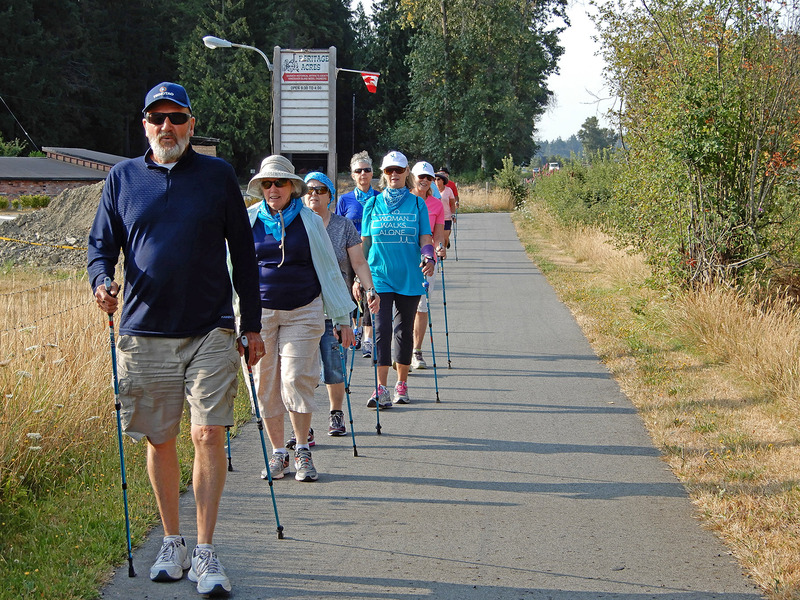 NOTE: If you have sore feet, knees, hips, back…..this may be the only way you can get great exercise! 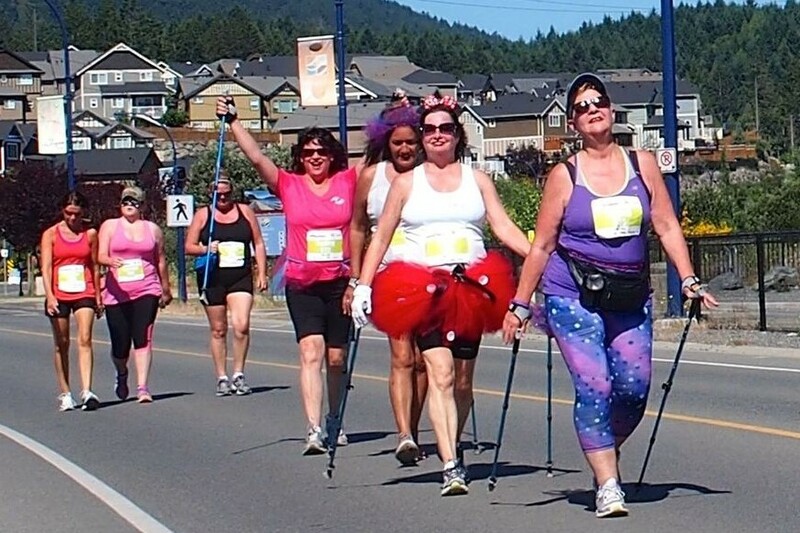 The other day I was out for my Nordic pole walking fitness session, zooming around the sidewalks in my neighbourhood, when I passed a (same age) lady I used to work with years ago. We stopped and chatted. She said, “When I get older and need poles I’ll call you and learn to pole walk.” I said, “YOU ARE MISSING THE ENTIRE POINT OF NORDIC POLE WALKING. Nordic pole walking is a way you can get super fit regardless of your age, or aches and pains.” She didn’t get it. She (and many people) have locked into their brains the idea that pole walking is to help old people with balance and stability issues. Because of this unfortunate limited viewpoint, they are missing one of the greatest exercises ever invented! Contains fun/social elements, and out in nature. Main roads and bus service to this location.